Bath’s Ruby Bolon fights for a rebound against Findlay’s Kristen Scherger during Friday night’s Kewpee Tip Off Classic at Bath High School. BATH TOWNSHIP — Longtime Bath girls’ basketball coach Greg Mauk wasn’t overly pleased at the way his team played during the preseason. However, after Friday’s 65-53 victory over Findlay in the opening round of the 15th annual Kewpee Tip Off Classic at Bath, it appeared that Bath had shored up most of its preseason deficiencies. With the win, Bath (1-0) will face New Knoxville (1-0) in tonight’s championship game of the Kewpee Tip Off Classic, following the consolation game that tips off at 6 p.m. In Friday’s opener, New Knoxville slipped out with a hard-fought 34-33 victory over Lima Senior. Lima Senior (0-1) will take on Findlay (0-1) in the consolation matchup. Bath’s relentless defensive pressure caused 24 Findlay turnovers Friday night, including 16 miscues in the second half. Bath turned the basketball over 13 times. Three players scored in double figures for Bath. Chandler Clark led the way with 17 points, including three 3-pointers. Teammates Esther Bolon and Ja’Dasia Hardison each added 11 points for the Wildkittens. After a back-and-forth first eight minutes of action, Bath slipped out with a 19-15 lead by the end of the first quarter. Bolon led Bath with nine first-quarter points. Bath’s defensive pressure wreaked havoc in the second quarter, forcing five early turnovers. However, Findlay’s Kaylee Brodine (22 points), a 6-foot post player, was unstoppable inside the paint, scoring 10 points to keep the Trojans close. Teammate Katie Thomas scored 20 points, including six 3-pointers. Bath led 32-29 at the break. 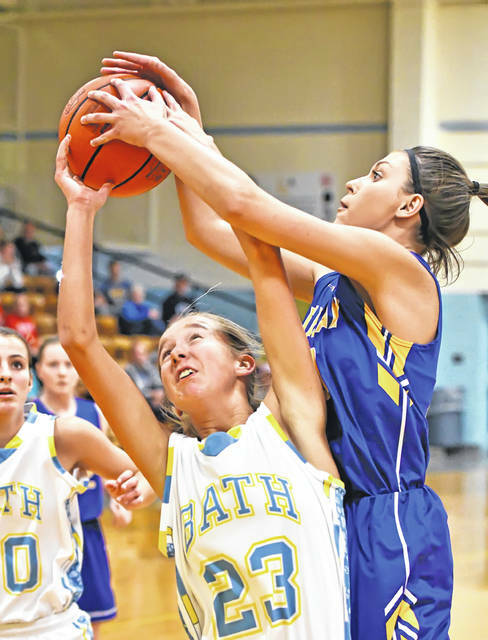 In the third quarter, Bath broke the game open, outscoring Findlay 27-9. Bath opened the second half with a 10-0 run to extend its lead to 42-29. Clark ignited the run with a 3-pointer. Bath’s pressure caused eight third-quarter turnovers. The Wildkittens led 59-38 by the third stop. Bath made 11 of 17 shots from the field in that eight-minute span. In the final eight minutes of action, Findlay outscored Bath 15-6. However, the Wildkittens held the Trojans off for the victory. For the game, Bath shot 40 percent from the field. Findlay countered with 49-percent shooting from the floor. “I thought, overall, that our defensive intensity was the difference in the game,” Mauk said. It wasn’t the start Lima Senior girls’ basketball coach Vince Halliday was looking for. And it probably wasn’t quite the finish New Knoxville coach Tim Hegemier was hoping for, either. However, the finish by the Rangers was good enough for New Knoxville to slip out with a hard-fought one-point victory over Lima Senior in the opening round of the Kewpee Tip-Off Classic. New Knoxville got off to a quick start, pushing out to a 13-0 lead with less than three minutes to play in the opening stanza. Megan Jurosic, a 5-foot-11 junior, led the Rangers with six of those points, scoring inside the paint. Erin Scott scored five points in that spurt, including a three-pointer. Jurosic led all scorers with 16 points, while also coming away with seven rebounds. Lima Senior scored its first point at the 1:07 mark of the opening quarter on a free throw by Cheyanne Bean. New Knoxville led 13-1 by the end of the first stanza. The Spartans were a dismal 0-for-8 shooting from the field in the first eight minutes of action. Early into the second quarter, the Rangers picked up right where they left off, quickly extending their lead to 17-1 within the first two minutes. Lima Senior’s first field goal on the night did not come until the 5:01 mark of the second quarter, on an inside move by Nakiya Sigman (5 points). New Knoxville led 23-10 at the halftime break. The Spartans were 4-of-20 shooting from the field in the first half. Lima Senior came out strong to start the second half, cutting the deficit to 23-16. The Spartans capitalized on a couple New Knoxville turnovers. Destiny McDonald scored eight points in the third quarter for the Spartans. McDonald led Lima Senior with 15 points on the night. A three-pointer by Sigman at the buzzer to end the third quarter, cut the New Knoxville lead to 25-23. Just seconds into the fourth quarter, McDonald hit a shot inside to knot the game at 25 apiece. “We turned them over a bunch and we got out and scored in transition,” Halliday said. “We kind of thought when the game was tied at 25 that we had an opportunity on a layup we missed. Then, they go down and hit a three. … We’re down three. I thought that was a big momentum swing. I thought if we could have gotten the lead there, that they may fold. But, overall, I thought they were the tougher team. I thought they executed better than we did,” he said. With 1:05 left to play in the game, Lima Senior’s Lexi Williams scored off a steal, and was fouled on the fast-break basket. Williams converted on the 3-point play to give the Spartans their first lead, 33-32. With 9.5 seconds left to play, New Knoxville had one more chance. The Rangers got the ball inside to Jurosic, who was fouled. With 2.1 seconds left to play, Jurosic went to the free throw line to shoot two. Jurosic canned both charity tosses to give the Rangers a 34-33 lead for good. Jurosic was a perfect 8 for 8 from the free throw line. For the game, Lima Senior shot 33 percent from the field. New Knoxville shot 32 percent on its field goal attempts. Hegemier warned his players that Lima Senior would come after them, defensively, in the second half. “I told them at halftime, ‘You better be ready, because they’re going to come to get you’,” he said. This entry was tagged bath, limasenior, newknoxville. Bookmark the permalink.